The international crude oil price of Indian Basket as computed/published today by Petroleum Planning and Analysis Cell (PPAC) under the Ministry of Petroleum and Natural Gas was US$ 53.50 per barrel (bbl) on 18.04.2017. This was lower than the price of US$ 54.59 per bbl on previous publishing day of 17.04.2017. 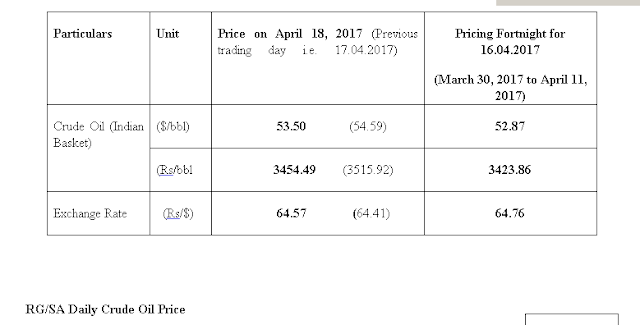 In rupee terms, the price of Indian Basket decreased to Rs.3454.49 per bbl on 18.04.2017 as compared to Rs. 3515.92 per bbl on 17.04.2017. Rupee closed weaker at Rs. 64.57 per US$ on 18.04.2017 as compared to Rs. 64.41 per US$ on 17.04.2017.